Welcome to the second installment of "Download of the Week." After previously visiting the 1975 Madison Scouts, this week, we jump a decade to the 1985 Troopers. For this week only on the DCI Fan Network, you can purchase the Video Performance Download of the '85 Troopers for just $3.99 (regularly $4.99), as well as an Audio Performance Download bundle featuring the 1985 top 12 Finalists for a discounted price of $15.99 (regularly $19.99). View all 1985 downloads on the DCI Fan Network. 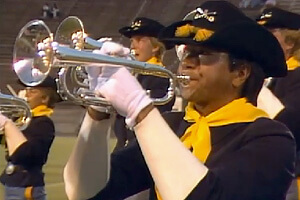 1985 was the year the Garfield Cadets won their third DCI World Championship trophy in a row. The Cavaliers made it into the top five for the first time ever and Suncoast Sound rounded out the top six with DCI's first all-original musical program, Robert W. Smith's "Florida Suite." It's also the year an unknown corps by the name of Star of Indiana blasted into the top 12 in its first season, the only time a corps has pulled that off with the exception of Bleu Raiders in 1972. Today's "Download of the Week" explores the Troopers' 1985 performance from Madison, Wis. Sandwiched in between eighth place Phantom Regiment and 10th place Star of Indiana, the corps' ninth place score of 86.70 is the highest the corps has achieved at any of the DCI World Championship Finals (though not the highest placement). One of the things that really jumps out on the video is seeing how the shocking advent of asymmetrical drill formations just five years earlier had reached into all corps' productions by 1985. While a few corps were experimenting with the type of flex drill popularized by Garfield Cadets over the prior two seasons, (especially in the "West Side Story" show of 1984), the Troopers were still somewhat traditional in drill maneuvering, but within an asymmetrical format. The flags tended to be in an arc for much of the first half. The guard was dressed in somewhat traditional attire, though with a lacy blouse highlight poking out of the military-style jacket collar and sleeves that served to feminize the uniform. Typical of front ensemble sections of the day, Troopers' pit was stretched in a single line across the front of the field, with far fewer members than are typically utilized in today's corps. The show opened with Clifton Williams' "Symphonic Dance No. 3, Fiesta," a work the corps brought back in 1994 and the same piece the Boston Crusaders played as a closer in 1999 and 2000. This selection was perhaps Troopers' most articulate presentation during its DCI years to date. Visually, it was quite arresting how the yellow in the flags picked up on the scarves worn by the brass and percussion sections. Aaron Copland's "Third Symphony" commenced with wide-open chords that captured the desolation of the Old West. (The corps revisited the piece in 1987, one year before Garfield Cadets incorporated the work as its entire show.) In the second part of the movement, one can easily distinguish the different pitches within the marching cymbal line, something I haven't noticed as much from cymbal lines over the past few years. Copland's "Buckaroo Holiday" (from "Rodeo") featured the brass section on flags, with a quite effective flying wedge coming down the 50-yard line. This was during a drum solo when such productions were still typically full-length offerings and not short interludes. In this case, the drum feature lasted a full two minutes and 30 seconds, with a short interval including a mini brass ensemble. Copland's "Red Pony" provides a glimpse at the guard's trademark rifle "suicide toss," when eight guard members formed a circle around a ninth and tossed the rifles to those directly across in the circle, right over the head of the center member. (I imagine she was possibly picked for the position for her nerves of steel!) The feature is a bit longer than what is actually shown in the video; you can hear the audience start to applaud a couple of seconds before the camera pans in. In the accompanying video clip, don't miss the cactus flags leading into the "sunburst." This is a classic Troopers move, which when done properly, is one of the most difficult drill maneuvers to pull off since everyone's interval is constantly expanding. Even though you know it's coming, the asymmetrical approach into the form sets up rather quickly and then suddenly contracts to make the expansion more dramatic. As expected, the audience reacted enthusiastically. The sunburst, still seen in contemporary Troopers productions, is the most identifiable iconic maneuver that links the current activity with its past. It's that connection with drum corps history that was one of the guiding goals of Jim Jones, the corps' founder and longtime director. He was no doubt pleased with what the 1985 show accomplished…in ways other than just the corps' highest score during its DCI history. This week only, you can save on 1985 World Championship Audio and Video Performance Downloads on the DCI Fan Network. Buy the 1985 Troopers' Video Performance Download. (Available this week only for $3.99. Regular price: $4.99.) Buy the Audio Performance Download bundle of all 12 Finalists from 1985. (Available this week only for $15.99. Regular price: $19.99.) Offer ends Monday, Jan., 24 at 8:30 a.m. ET.